IndianStocksNews.com: When should you buy stocks in current market turmoil? American stock markets are plunging everyday with high volatility. Yesterday (Aug. 19th) again DOW Jones plunged 173 points or 1.6%. I came across one theory while researching and reading on stock markets that I thought must be shared with IndianStocksNews.com readers. Here it is. We are witnessing a free fall in global stock markets with investors vanishing from stock markets. In such volatility, what is that we can expect in near future in global stock markets and Indian stock markets? While researching on stocks history and looking at stock chart patterns, I came across American stock market charts. I also read a few things from some analysts who had studied the chart I was looking at and what they were saying was quite interesting and scary too! Above chart shows American stock market index Dow Jones from Year 1900 till 1950. Checkout the great fall of stock markets between 1930 and 1932. Then the rise of markets in 1936 and 1937, followed by big falls in 1938, rise and bigger fall in 1940-41. 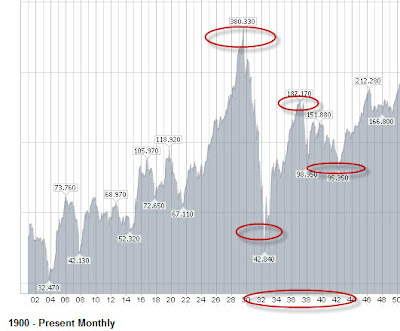 This entire pattern is spread across almost 10-11 years before resuming another bull market in history. Now look at the below stock chart of Down Jones for past few years, especially from 2008 when global recession started till 2011, till date. 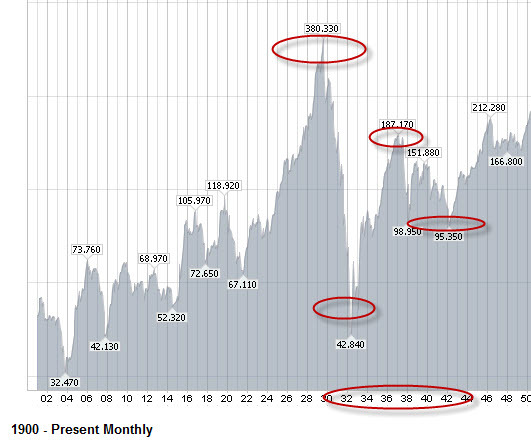 The stock chart seems to be following similar pattern of what was experienced in above chart way back in 1930s. The great fall in 2008, rise in past 3 years till 2011 and then again the resume of downtrend. In context of Indian stock markets, where can this go? BSE SENSEX is trading today at PE multiple of 12.5. In past, whenever stock markets have tumbled, SENSEX has traded at lowest PE of 11. 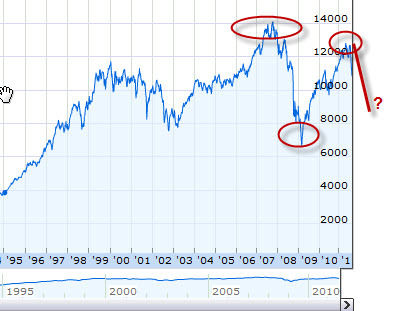 So to see the SENSEX trading at P/E of 11, it will have to go below 14,500 levels. Now, will SENSEX go there? It will if American and global stocks plunge further in next few weeks/months. But what I believe is, if SENSEX trades below 15,500 levels, most of the stocks would be at very attractive valuations and long term investors should buy stocks in small chunks for sure if world economy does not enters double dip recession which we would come to know about in next few weeks. Read: Stock markets crashing – what to do? The rise we had seen in past 3 years was mainly due to economic packages declared by Federal government in US and other countries which was nothing but artificial boosting economy by borrowing and printing money or reducing taxes. But when money is borrowed, you have to return it at one point of time to lender. US is unable to do it. So are the other governments and it is clearly visible from whats happening in Europe. And when you print money, inflation starts skyrocketing that is what exactly happening in USA and other countries. Currency starts losing it's value and your money can buy lesser and lesser day by day, in other words, everything becomes costlier. And this is one of the reasons why Gold price is increasing everyday. As all currencies start losing it's value (buying power), how can you protect purchasing power of your money? Buying safe assets like gold, silver, maybe land etc.. Buy gold in small quantity to protect some of your wealth as currency problem is going to take years before all problems are solved and Gold would surely make new records in coming time. Read: Why should you buy gold now?